Over the past few days we’ve finalized the addition of the Lidgren networking library to XenoMiner. This open-source project is an invaluable tool for anyone bringing XNA over to PC, as the networking libraries built into XNA are not accessible on PC except in debug modes. With the implementation of the Lidgren networking system, we’ve abstracted the Gamer classes out to allow our XNA-style networking code to slot right in from the Xbox version. The good news here is that what worked on Xbox should work “out of the box” on PC. So far testing is going well. Through the testing process we have uncovered a few issues with the messaging system that have led us to do a stream-lining rewrite of most of the voxel set/remove messaging code. This is the basic network messaging that handles adding and removing both voxel blocks and constructed items from the game and ensures those changes are carried over to the other clients seamlessly and without conflict. Needless to say as we’ve refactored this code it has become easier to read, faster to work with, and we’ve managed to squash some pretty hairy bugs that weren’t readily visible in the old methodology. We hope to see further updates of this kind throughout this week. If all goes well we’ll move from there into a limited testing release with a core testing group – it won’t be long after that and we’ll move it into a public testing release. Thanks to all our fans and their constant support. 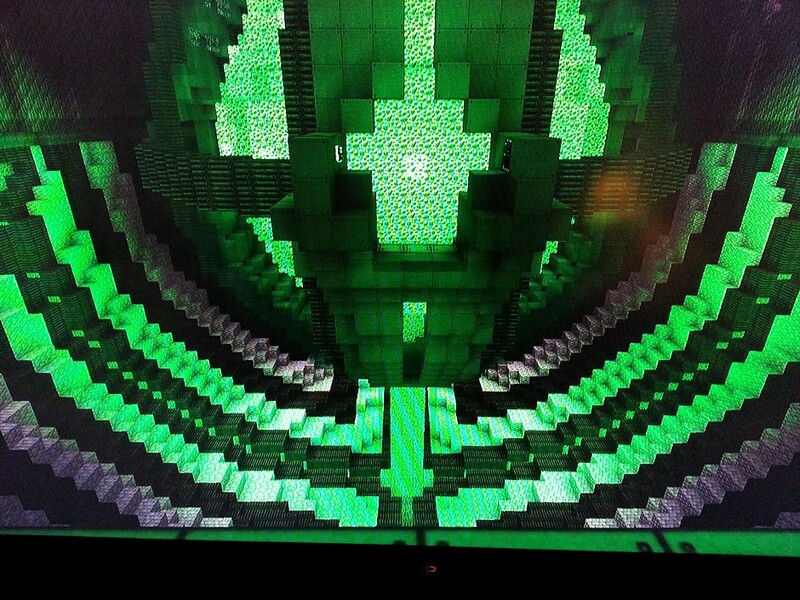 Speaking of fans, pictured above is an incredible “Reactor” made from Endurium that the Leviathan group put together. Thanks to Kevin Hallden on our Facebook page for posting this. Mob spawn radius tightened (more action). Mob pathing improvements (less lag). What doesn’t show in this update but is really exciting is that we’re in Week 2 of having a full time developer. PC players will be glad to know that Rod has made great strides in bringing PC multiplayer into fruition. We’re now in the debugging stages of implementing this feature! Hiring our first full-time employee! HUGE NEWS GUYS! 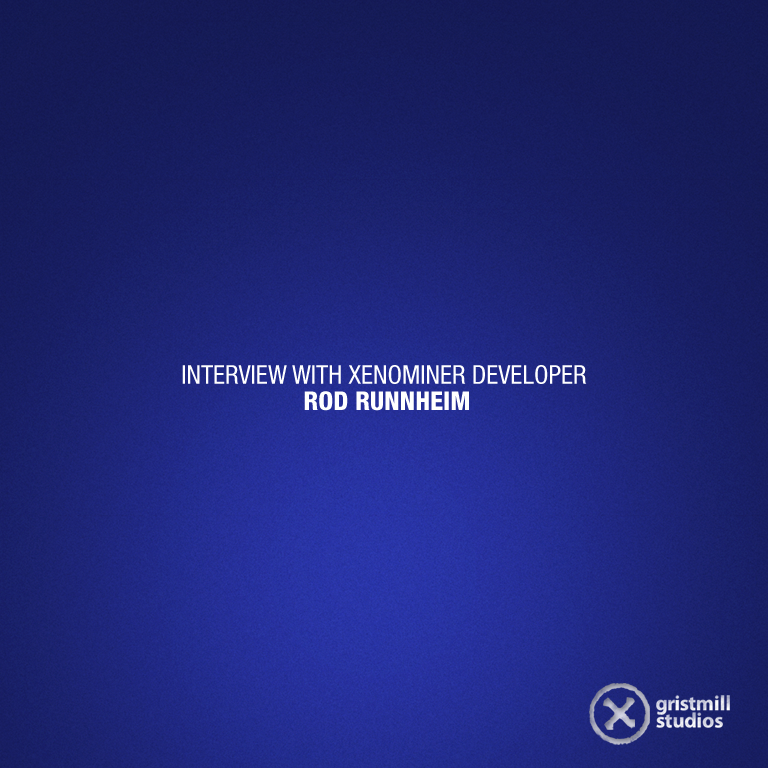 Rod Runnheim, the lead developer on the Gristmill team, will officially be working on XenoMiner and other Gristmill projects full time starting Monday! That means better gameplay, better features, more content, more everything! I decided to ask him a few questions..
Jesse: What were you doing before, and what will you be doing now? Rod: I’ve had a long a career in software development, my most recent job was working for The Weather Channel. I built server based solutions and systems, and worked on broadcast products as well. It was a great job. I had just been promoted to management, and three days later I handed in my resignation. That was an interesting conversation on more than one front. Thing is, the dream is right in front of me, so it’s time to start living it! J: What are the first Gristmill and XenoMiner projects you’re going to tackle next week? R: A solid animation system, weapons and effects (lots of! ), and more biome based terrain. We’ve given the advanced adopters a sneak peak, time to get it out there for real. Dare I say it – PC multiplayer. Also working on more game modes, in fact, I’ll be working on a new game set in the same universe. The great thing is, most of the technology we develop for it will be folded back into XenoMiner itself almost immediately. J: What does it feel like to know you’ll wake up Monday and your only boss will be Gristmill/XenoMiner fans? R: We have so many great fans – it’s gonna be awesome! We’ve set our sights high, and want to start generating content and features at a pace our fans deserve. We also want to expand our reach by getting to more platforms. J: What aspects of XenoMiner do you think need the most love and attention? R: More content, and then even more content. We’ve hinted at a lot of things, delivered on some. Xenos contains a universe of possibility. I want to start expanding that. More specific? More voxel types to build with, more monsters to hunt and be hunted by, more weapons. There are systems to add as well, pressurized spaces, plant life, expanded Xeno structures and runes. That just gets us to where we wanted to be 6 months ago. Then the real fun begins… (yeah, gotta tease here). J: What advice can you give to aspiring game developers that want to work for themselves rather than slaving under the corporate chains of some behemoth like EA? R: Time is the most precious thing you have. If you’re not using it to build product then question what you’re doing. If that sounds too much like business – too bad. You’re building games! Find the audience, match it to your skills, then find the fun! Build a TEAM. I mean a real team, not your cousin and best friend. Find people that want it as badly as you do. If you think you’ve found ten people that share your passion, you’ll be fortunate if you’ve really found one. This stuff is hard, and taking time out to pursue it had better be the team’s passion or it won’t happen. Do NOT be the only work horse for that team. If you find others are not as into it as you are, find a different team, or build it. But, catch-22, don’t do it alone. You need a sounding board, and you need someone to cover your weaknesses – and you have them. If you think you don’t, better find them, or they’ll break you. Communicate. Teams aren’t based on skill, they’re based on communication. Fill each other’s gaps (not literally), mentor where you can, applaud each other’s successes. The best thing you can do is find one day of the week and schedule it as game night. Everyone must agree on which night, and everyone should attend, no excuses – do you want this or not? Communicate, communicate, communicate. If you’re not on the same page, you’re going to waste time. And again, time is the most precious thing you have. J: A lot of kids have written us on Facebook saying they want to make games someday. What advice would you give them? R: Learn… about everything. Building games isn’t about pushing pretty pixels, it’s about building experiences. Read a lot, take math and science seriously. It’s amazing how much you’ll use it. Want to build an alien swarm? What are they going to look like, how do they behave? Nature has plenty of bizarre answers for you right now if you’ve kept you’re eyes open. If you don’t like math, then find a way to use it for small things that pertain to your game. Make it a tool. If you just want to design games – you’re not off the hook either. If you don’t have a basic understanding of how game systems work, you won’t be able to communicate. If you can’t communicate, you don’t have a team, if you don’t have a team all you’re going to do is waste time. And time is the most precious thing you have. For all you younger kids, don’t wait to start.. you can start as early as 9 or 10. Do coding tutorials with youtube, khanacademy.com or even with http://scratch.mit.edu/, which is a programming language made for kids. Thanks so much for the support everyone! Rod will be jumping full time into the Gristmill/XenoMiner cockpit bright and early Monday morning.